Today we didn’t leave the boat till 2 pm which was a lovely break. We had a lecture on the Rhine and the Main in the lounge. I had trouble keeping my eyes open so I skipped lunch and rested for a half hour. 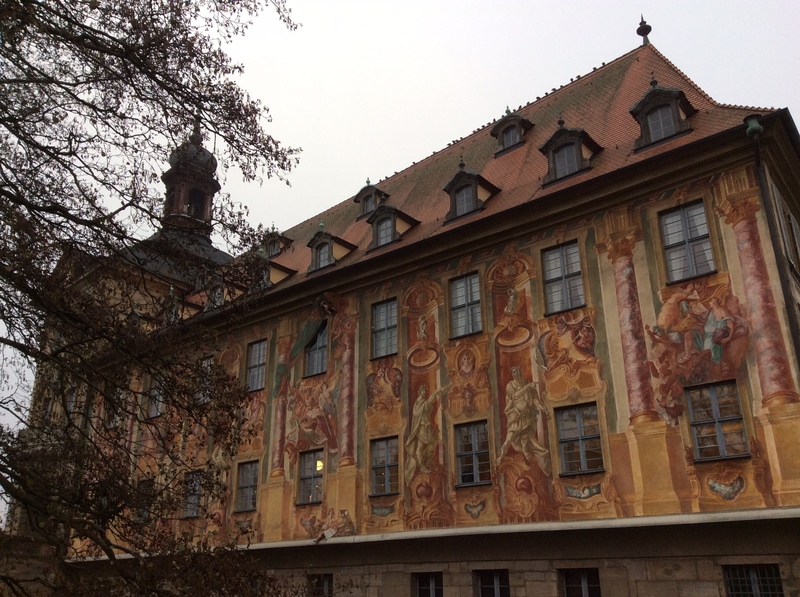 A graduate student walked us around Bamberg, a town in Bavaria, Germany, located in Upper Franconia on the river Regnitz close to its confluence with the river Main (where we parked our Viking ship). It’s known for its smoked Rauchbier (beer). Like Rome, it was built on seven hills with a church topping each one. Originally Bamberg was populated by Slavs, which showed me that we were drawing closer to our final destination: Prague. Bamberg had an incredible cathedral (with the tombs of emperor Henry II and Pope Clement II), but I only took this picture of its town hall (Rathaus) from the bridge. Our guide talked about the witch trials that claimed over 1000 lives and the Jewish quarter decimated by Nazis in WWII. The Old Town Hall (1386), built in the middle of the Regnitz River, was accessible by two bridges. Paintings on it, which you can see above, were incredible. Besides stopping briefly at The Schlenkerla, one of Bamberg’s famous breweries and taverns, we also paused where philosopher Georg Wilhelm Friedrich Hegel (idealism), briefly lived. Our graduate student’s thesis featured him. In March 1807, aged 37, Hegel moved to Bamberg, where Niethammer had declined and passed on to Hegel an offer to become editor of a newspaper, the Bamberger Zeitung. Hegel, unable to find more suitable employment, reluctantly accepted. He lived there only a year. At the Christmas market, I bought some warm mittens. I enjoyed coffee and stollen at a cafe where we saw other Viking passengers. That night, we had a many-course Captain’s dinner. Sad to see our cruise winding down. Good bye to Simona, my room steward, and all the others. This entry was posted in travel, Uncategorized and tagged Cities of Light, Miltenberg, Paris to Prague, Rothenburg, Viking river cruise, Würzburg. Bookmark the permalink.